Cloud media streaming service is one of the hottest trend in computing to address the ever-increasing demands of secured digital storage space. Amazon has officially announced the launch of its new highly-anticipated cloud-based services – Amazon Cloud Drive, Amazon Cloud Player for Web and Amazon Cloud Player for Android, which allow for secure uploading and storing of music and other contents in the cloud (online storage on Amazon’s secure servers) and easily, conveniently access them anywhere on Android-based devices, Mac and Windows PC. 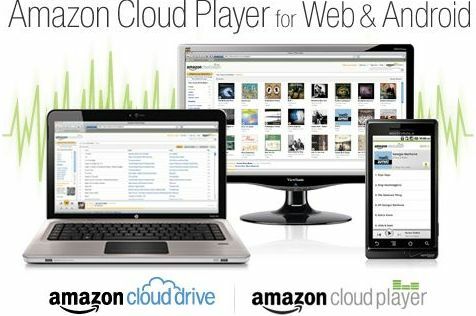 Amazon Cloud Drive that able to store virtually all kinds of digital files including music, photo, video and data is currently just available for US customers with 5GB of free online storage, upgradeable to free 20GB cloud storage with purchase of any Amazon MP3 album (time-limited promotion). In addition, Amazon also offers additional paid storage plans from 20GB to 1TB storage space, priced at $20 per year – $1000 a year, respectively. Amazon Cloud Player for Android is built into the new version of Amazon MP3 App, while Amazon Cloud Player for Web initially supports Internet Explorer 8+, Mozilla Firefox 3.5+, Google Chrome, and Safari for Mac. According to Amazon, new purchases from Amazon MP3 store are stored directly in your Cloud Drive for free of charge – without taking up any of your free storage space.